And yes, I’ve talked to the SG representatives by phone three or four times, which increased my unsatisfaction even more (not because the way they do their jobs, they’re excellent customer support officers). 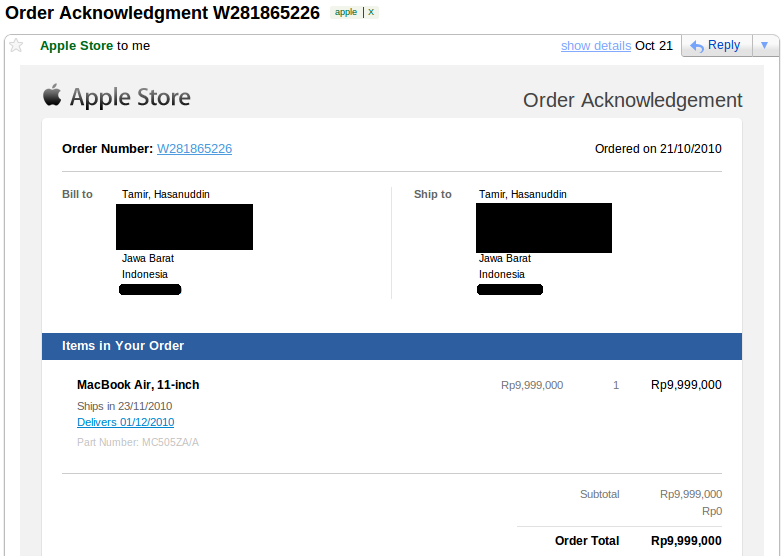 They told me that the refund was already done in the Apple side on 16 Dec 2010 and would take seven business days to get to the bank. Frankly, I’m not really sure what to expect anymore. 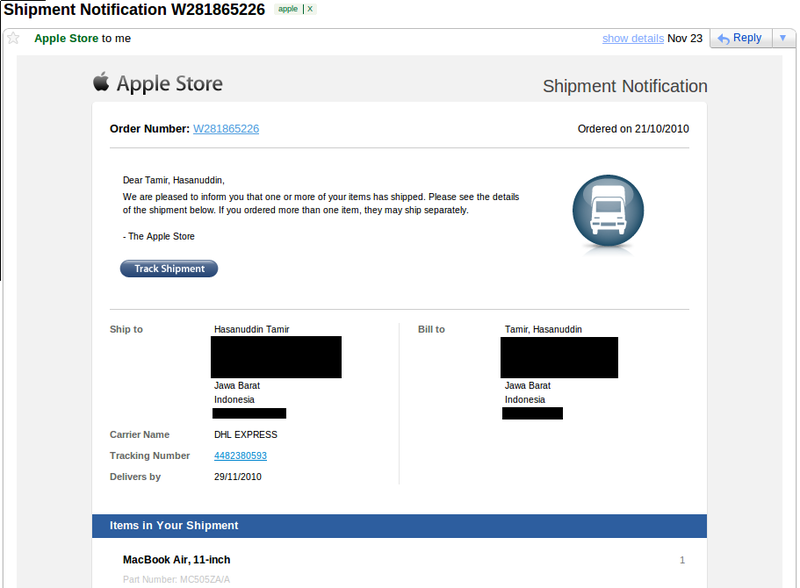 I don’t need the money back, all I want is, as I ordered, a MacBook Air 11″ (which was supposed to be my first Apple product). 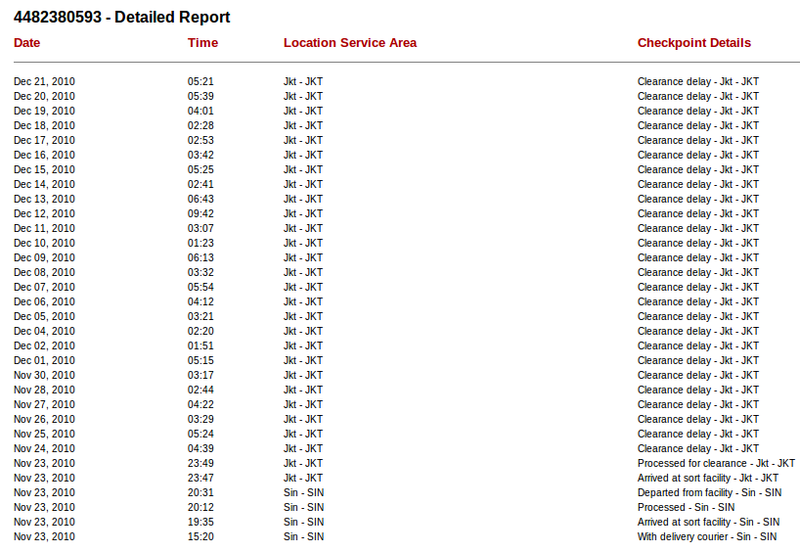 Here are the links to screenshots of the DHL tracking website indicating the shipping status (Dec 21st, 2010 20:30). I called the bank on 23 Dec and they confirmed that the refund from Apple Store was booked on 19 Dec so the transaction was officially cancelled, and the installment was cancelled as well. Due to the fact that I’m not the one who initiated the cancellation, I’m freed from the penalty. 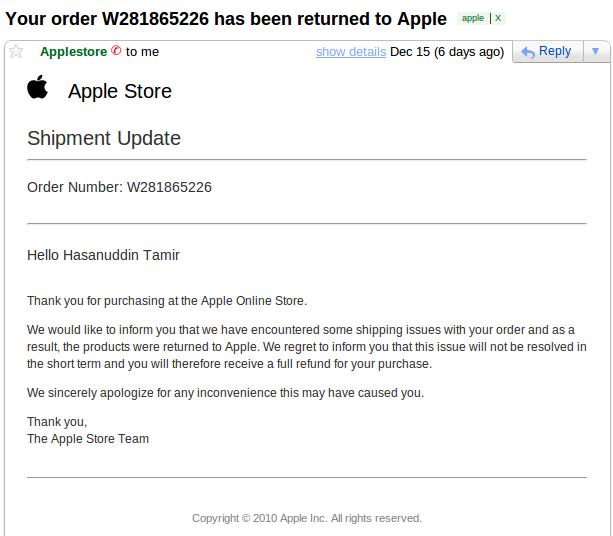 On 24 Dec SG Apple Store called me and I told them about the bank confirmation. On the very same day I purchased the MBA 11-inch from the local store. emang kehebatannya mba apa om, sampe dibela2in gitu? ringan, tipis, kokoh. user interface ok, daleman ok.
kalo soal bela-belainnya ya karena gua mesen barang gak datang-datang. bisa terjadi barang apapun. + Buat Amen, di Mac juga bisa menggunakan Microsoft Windows kalau mau. – Closed Source / jadi kurang pas buat yang cenderung memilih fleksibel dengan base, kernel, dan binatang low level OS lainnya. – Menjadi bergantung pada Vendor di level manapun tingkatnya.